Shares in Toshiba have gained more than 5% as speculation intensified that the electronics giant is set to scrap its high definition DVD format, HD DVD. The firm said it was reviewing its business strategies, but added it had made no decision over HD DVD's future. The format has suffered from the defection of major US film studios to Sony-backed rival Blu-ray. Analysts said that an end to the war meant Toshiba could refocus on other areas and the industry would gain too. The comments come as UK department store John Lewis told the BBC that it did not expect to order more supplies of HD DVD players when current stocks run out. "We have sold both players since launch to give our customers the best choice of available technology," said John Kempner, buyer for the firm's vision arm. "Recently customer demand has moved strongly towards Blu Ray as a result of the decisions made by the US film studios." Toshiba acknowledged media reports that it would discontinue its HD DVD business but said that nothing had yet been decided at the moment." Toshiba shares climbed 5.7% to close at 829 yen and was one of the biggest risers on Japan's benchmark Nikkei 225 share index. Last month, Warner Brothers became the latest Hollywood studio to throw its weight behind Sony's Blu-ray format, leaving just Universal Pictures and Paramount Pictures favouring HD DVD. Analysts had seen this decision to switch allegiances as a tipping point. Video rental firms, including Blockbuster and Netflix, have said they will phase out the Toshiba-backed format. And last week, Wal-Mart, the world's largest retailer, announced it would only sell high-definition DVDs in the Blu-ray format at its 4,000 US stores. Does anyone care about high definition? "It doesn't make sense for Toshiba to continue putting effort into this," said Koichi Ogawa, a chief portfolio manager at Daiwa SB Investments. "It needs to cut its losses and focus its resources on promising businesses." Paul O'Donovan, principal analyst at research firm Gartner, predicted that Toshiba could announce its defeat "within weeks". "They are under a tremendous amount of pressure to pull out following Wal-Mart's stance and Best Buy's decision to recommend Blu-ray disc players over the HD DVD format," he said. He attributed Blu-ray's success to Sony's exclusive tie-ups with the industry's biggest DVD player manufacturers, including Philips, Panasonic, Denon and Pioneer, which convinced Hollywood to back the more sophisticated technology, despite the higher initial cost. According to research firm IDC, the cheapest Blu-ray player on the market is Sony's Playstation 3 video game console, costing about $400, while the cheapest HD DVD system is priced at £117 ($228) on online retailer Amazon. 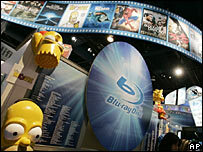 Some observers now predict increased competition among Blu-ray players leaving the consumer the ultimate winner. "This has been a long overdue end to the format war that has frustrated and confused consumers, and will allow vendors to focus resources on the Blu-ray technology," said Claudio Checcia, an IDC analyst. Blu-ray and HD DVD have fought to become the pre-eminent high definition format to help revitalise the $24bn global home DVD market. There is not much difference between the formats. Both feature superior picture and sound quality and have better data storage capacity, though Blu-ray has 20 giga-bytes more storage space than its rival. But the two formats are incompatible with each other and so consumers have had to choose between machines that played only one type of disc. As a result, many have held back to see which would become the industry standard and, like the battle between Betamax and VHS video recorders in the 1980s, this has been damaging to the industry as a whole. DVD players from South Korean firms LG and Samsung are the only two to play both rival high-definition DVD formats, but they can cost twice as much as single-format players. The video machine war lasted a decade, so the prospect of Toshiba abandoning its HD DVD just two years after launching the player has been cheered by investors and analysts.